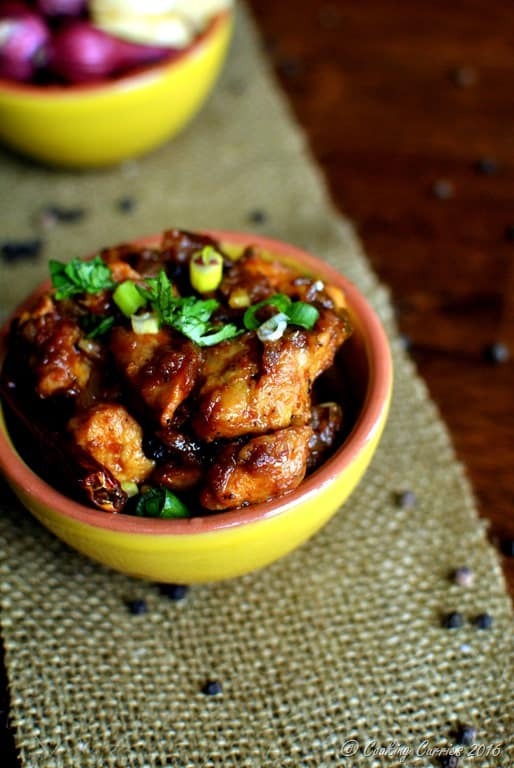 This Kerala Style Chicken Chilli roast made with three different chilli peppers in it, definitely has a kick to it, that all spice lovers will love! 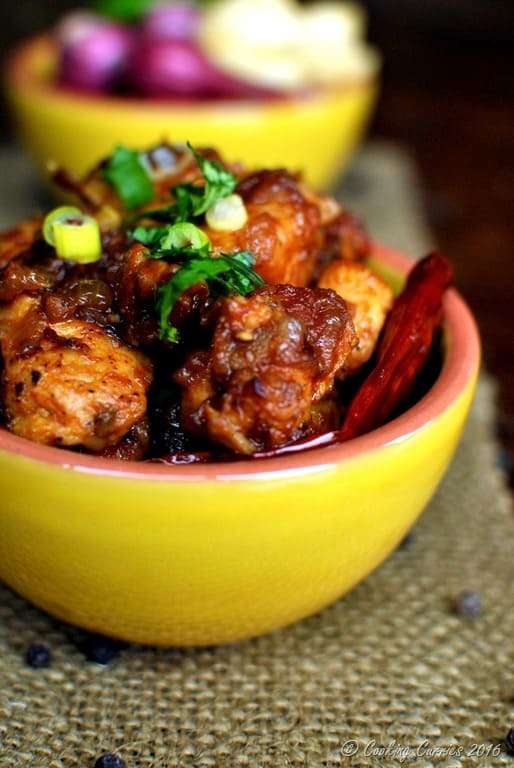 This Chicken Chilli Roast is a popular one at home when we need to take a break from out regular Chicken Curry. I have made it a couple of times now in the last month or so and it is already a favorite at home and among friends. 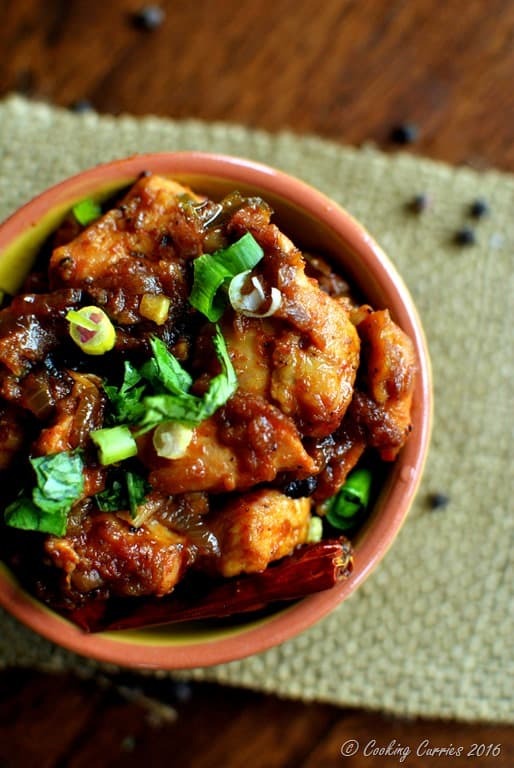 It is a pretty simple adaptation of a recipe from a popular TV show in Kerala – Magic Oven. The ingredients are fairly simple, most of which you can find in a regular grocery store! I have also managed to eliminate all that deep frying from the original recipe and still keep it tasting great! It has a lot of elements that gives it a lot of heat – black pepper, cayenne and Thai green chillies. I mean, the name is Chicken Chilli Roast, so there you go! Chilli here means chili peppers and not the chilli preparation. Feel free to reduce the amount of black pepper, cayenne and Thai green chillies at any stage of the process, if you are not up for the heat. But I strongly suggest using all three kinds of pepper to get that chilli heat to it. Canola Oil – 4 tbsp. Crushed Black Pepper – 2 tsp. Red Chilli Powder / Cayenne Powder – 1 tsp. Marinate the chicken with the spice powders and keep aside for 20 minutes or so. Grind together the ingredients for the paste to a coarse paste (see pic above) and keep aside. 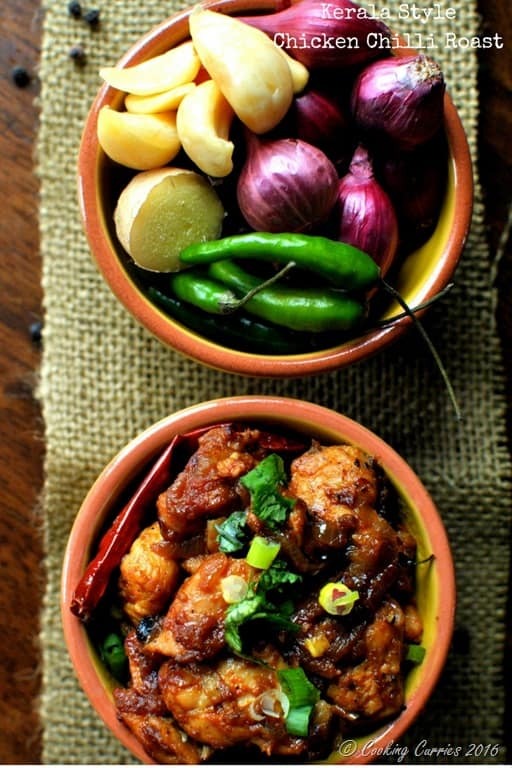 Heat oil in a heavy bottomed pan and add the onions, dried red chillies and curry leaves to it. Sauté till the onions almost caramelize and then add the ground paste to it. Sauté for a few more minutes till the raw smell of garlic in the paste disappears. Now add the tomatoes and cook till they are soft. Once soft, add the marinated chicken pieces and cook covered till the chicken is done, stirring occasionally. Now add the soy sauce to the pan and mix well. Check for salt, add more if you want. Add a little more ground black pepper if you want more heat. If not, remove from heat, garnish with the scallions and cilantro and serve hot with rotis, parathas or even rice! AJ took it for lunch the next day and mixed it with some baby spinach and other salad greens and said it was yum! Check for salt, add more if you want. Add a little more ground black pepper if you want more heat. 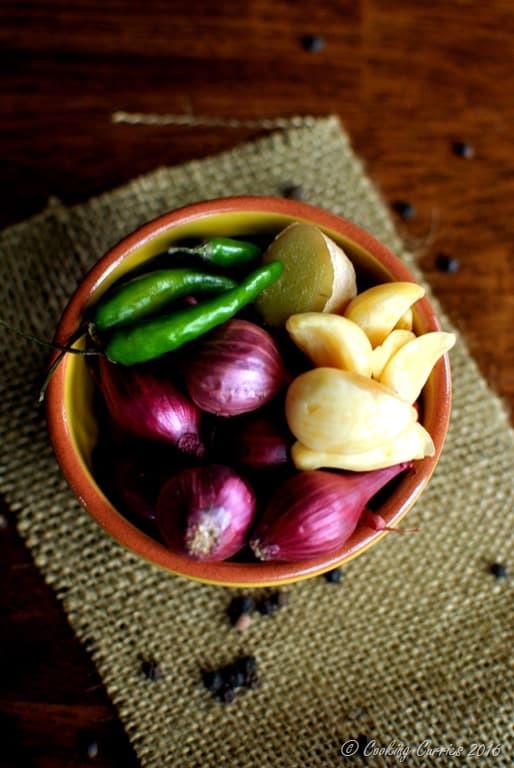 If not, remove from heat, garnish with the scallions and cilantro and serve hot with rotis, parathas or even rice!